…on a snowy evening. That was the theme for the most recent Poet’s Club shipment from Woolgirl. I was one of two designers for this month’s kit (originally scheduled for December, hence the snow theme). Carrie Sullivan (Irishgirlieknits) designed the hat. 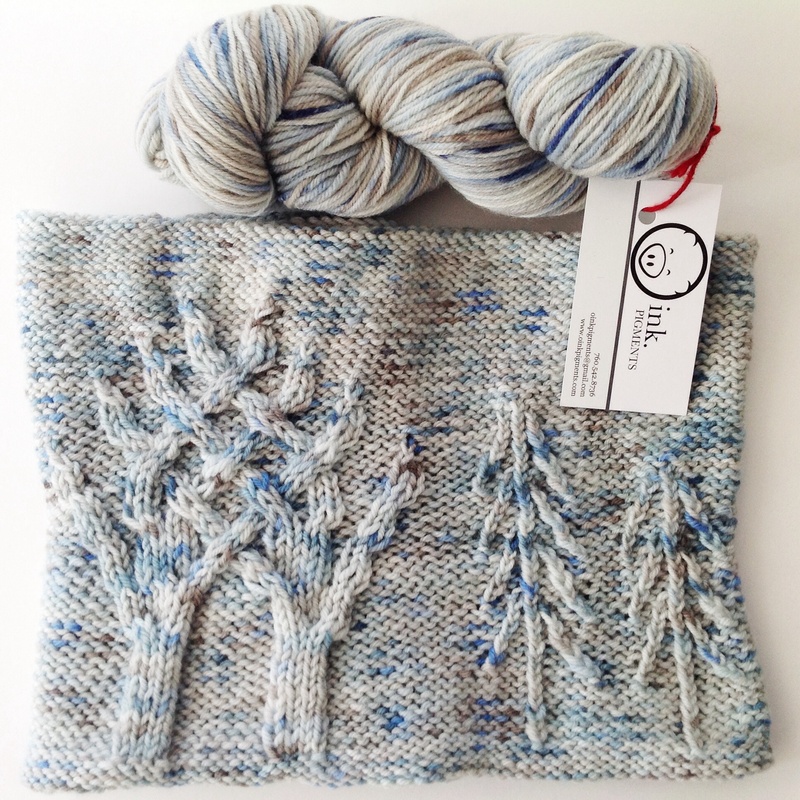 I designed this bonus piece, the Snowy Woods Cowl featuring trees and more trees. The yarn is DK 100% Superwash Merino Wool from Oink Pigments in the Robert Frost Colorway. With hints of blue and brown, it suggests the woods in snow. Spring has sprung in the Pacific Northwest. The first cherry trees are blooming, as are the daffodils and crocuses, but winter is hanging on in many parts of the country. This cowl is a quick knit; I hope that some club members are able to knit and wear this soon. 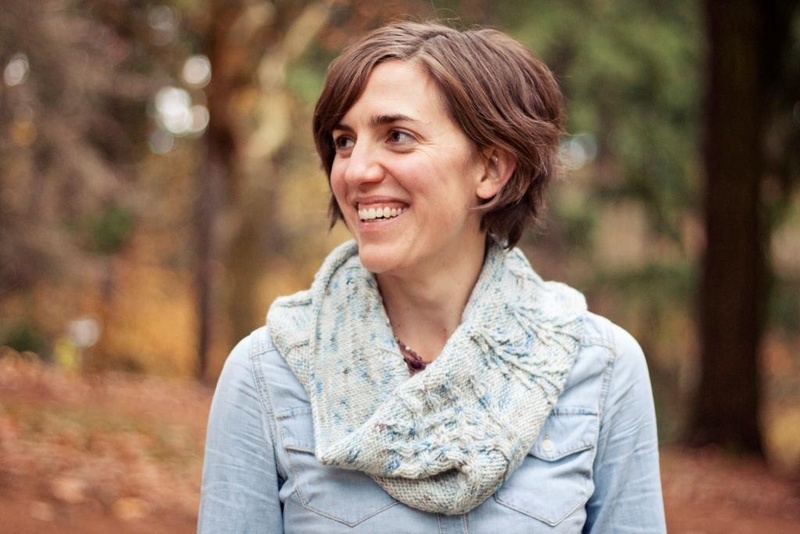 The Snowy Woods Cowl is a six month exclusive for the Woolgirl Poet’s Club; it will be available here in late August. Just in time for knitting for next fall and winter! What’s happening in your neck of the woods? Winter? Spring? Are you still wearing your woolies? This entry was posted in Knit, pattern design and tagged poet's club, robert frost, Robert Frost Colorway, snowy woods cowl, woolgirl, Woolgirl Poet's Club. Bookmark the permalink. 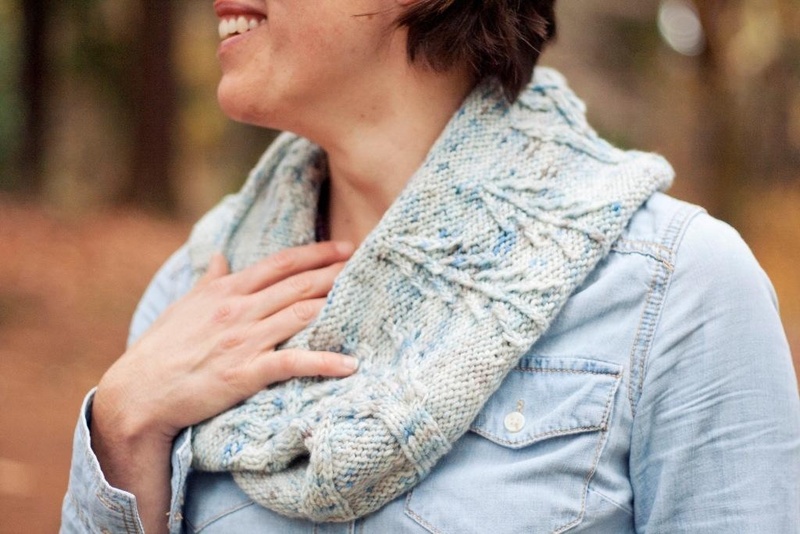 This cowl is lovely! Well done. I am still wearing my woolie cowls – though the weather has started to break here in Southern Indiana. They are the last to go – so comforting for my long neck. I adore the trees! Very clever use of cables 🙂 It goes perfectly with the yarn. Wow! Those really do look like trees! Yes! So pretty, and the yarn was a great inspiration. Reminds me of Vogue’s Enchanted Forest cardi! Yes, I knit that one about 20 years ago. This time I was inspired by the intertwined trees in Barbara Walker’s second treasury, the one with the charted patterns. So much beauty!